I have a feeling deep down in my gut that Until Dawn is going to be incredibly divisive. It will be held up as an object of excellence and as one of absolute failure by those who tune in and out of the various things that the game is doing. I love Until Dawn. I rarely feel this way. I’ve made myself into a stone, unable to feel prerelease hype deep beneath the ice shell that I have crafted to keep me from the promotional material world of multi-year advertising campaigns. When I first heard about Until Dawn a while back, I filed it away in the Could Be Interesting section of my mental warehouse and promptly decided to ignore anything about it until I could play it (that’s my method for anything in the Could Be Interesting file). I’m very serious when I say that the moment I launched the game was the moment that I found out about 90% of the game’s concepts and content. And, if I’m being very honest, I think that reading anything about this game probably takes away some of the magic that I felt when playing it for the first time. If the game looks interesting to you in any way, stop reading now and just go play it. You’ll be better for it. If you’re sticking around, let me lay it out for you. Until Dawn is a narrative game that cleaves as close to cinema as possible for videogames. It is fully motion captured with famous-to-less-famous actors who contributed both their faces and their bodies to create dynamic movements and reactions in a game, and you take control of those various bodies in order to make decisions for those characters. Peter Stormare, certainly the biggest “get” in the game, has some of the most GIF-able reactions I have ever seen in a game, and he chews scenery better than anyone else in the business. Beyond the technical, Until Dawn is a horror game. It leans so hard into its horror tropes that a lot of them snap like safety belts in a Final Destination film. More on that in a minute. The matrix of decision in choice in Until Dawn is called The Butterfly Effect, and it’s essentially a system for tracking what the player decidedsto do. You can trace all of your decisions back through time, and this is incredibly important for the moments when you have no idea how you got from point A to point B. “You make choices and the choices matter” has been the bugbear phrase of videogames for twenty years. Giving players narrative options that actually pan out into their own unique scenarios has been promised by many games, and when it has been achieved (if it was achieved at all, or even attempted) it has mostly been through resource-efficient methods. The Planescape: Torment method, which is still celebrated by fans, was merely centered on changing NPC reactions; the Heavy Rain method mostly centered on making it seem like your choices mattered while largely ignoring them. Until Dawn seems to be the furthest along in this paradigm. When characters make choices about whether to jump down a ledge or run along a path, those choices echo for a very long time. The Butterfly Effect system allows you to trace those echoes, and having played and replayed some sections, Until Dawn largely delivers on the promise of narrative splitting and choice. The kinds of choices that the player can make are varied. During an action sequence, you might choose a dangerous or safe option. During a discussion, you might shame a friend for being afraid or try to calm them. While these decisions seem different in kind, Until Dawn makes it very apparent that there is no dissonance between how these characters act toward one another and how they react toward the horrifying circumstance that they are in. These teens are living their lives, and you’re along for the ride. The game centers on a tragedy. Hannah is pranked by her friends and runs from the mountain lodge and into the wilderness. Her sister Beth follows her. They disappear, and their bodies are never found. A year later those same friends that pranked Hannah answer the call of brother Josh to reassemble at that same lodge to have a small celebration in his sisters’ honor. From there on out it is trope town, and during my first playthrough I was constantly calling out the visual and narrative references that the game was throwing my way. This, I think, might be the biggest stumbling block for a lot of players: this is a game that functions in the same way that contemporary horror film has functioned since the release of Scream. We currently live in a world where horror comments on itself to such a degree that there is no “meta” level any longer. Instead, we are all inside the horror text. Parody, comment and sincerity all exist on a flat plane, and for every “the trope reversal is the joke” like Cabin In The Woods there’s a completely serious, yet just as comment-full, film like The House of the Devil. Until Dawn’s writers Graham Reznik and Larry Fessenden both come from the independent production culture of films like that second one, and the writing of Until Dawn has that mark on it. The stumbling block is that it is very difficult to know if the audience will be willing or able to cue into the subtext that Until Dawn needs you to have in order to fully enjoy it. It is fully possible to play this game and find its on-face stereotypical nature unbearable and unoriginal, and I can imagine someone thinking that the ham-fisted oversexed teens and their silly emotional drama are all the game has to offer. But it can give you so much more. Horror really hits its genre highs irrespective of its narrative angle; a truly terrifying scare is going to hit you if the framing, the music and the mood are all in sync. I’m especially susceptible to these things, and while jump scares don’t tend to jar me as much as they do some others, general anxiety gets me way worse. 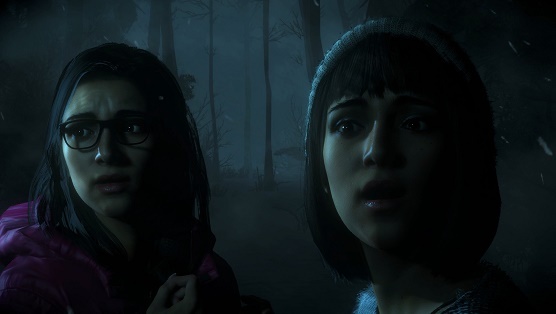 Until Dawn productively uses its tropes to get us halfway there from the opening moments of the game: you know something terrible is going to happen to these teens. Terrible things happen, of course, and there are jump scares aplenty, but what got me the most was just wandering through the game’s landscapes trying to figure out what was going to happen. It doesn’t help that the game has a mechanic centered around telling you possible butterfly-effected futures. When a character finds a totem on the ground, they can flip it over. When this happens, the player sees a possible future, and sometimes that future is scary as all hell, so when the scenery of that future looks like a location you’re currently in, the anxiety goes through the roof. Something could be coming. When watching or playing something scary, I stand up. I spent a lot of time standing up while playing Until Dawn. On top of the moment-to-moment teen horror, Until Dawn also has some mysteries inside of it. What happened to the sisters? Who is the creepy dude that we keep seeing in the foreground of shots? [Peter Stormare?—Ed.] What the hell is up with this scary mountain? Surprisingly, all of these mysteries are incredibly engaging, and I really did want to know what was happening and what had happened in the past. The game has a basic “pick up clues” system that can sometimes impact characters, and the first time through the game my friend and I had long, drawn-out conversations about how all of the clues came together while comparing and contrasting the data that the game was collecting for us in convenient inventory screens. My quibbles with the game come down to signaling. I wish that the game did a little more to suggest that it was responding to, or was at least in conversation with, the tropes it builds on earlier in the game. I also would have wanted the representation of Native American concepts and iconography to have been fleshed out a little more in the game itself, although some of my fears about the essentialism that gets deployed in the game proper is alleviated by some additional shorts in the game’s bonus content that suggests that everyone did their appropriate and specific homework. Boosterism is out of character for me, and I’m honestly as surprised as anyone else is that I’ve had such a (dare I utter the word) visceral reaction to this game. I’ve had to dodge specifics not because they’re not worth commenting on (and my god is the whole game worth talking about in detail) but because I don’t want to rob you of the experience. Until Dawn was developed by Supermassive Games and published by Sony. It is available for the PlayStation 4.